The purpose of the paper. Substantiation of structure (design), parameters and operation modes of the improved vibratory finishing machine. Analysis of dynamical processes which occur during “lap over lap” dressing. Investigation methodology. Mathematical model of motion of the mechanical system of vibratory finishing machine was developed on the basis of Lagrange differential equations of the second order. For the purpose of describing friction between the working surfaces of the laps, the Coulomb friction model was used. Stiffness parameters of all elastic elements were modeled in accordance with the Hooke’s law. Energy losses in elastic elements during their tension-compression were taken into account by corresponding coefficients of dissipation (damping). Simulation modelling of motion of the machine’s mechanical oscillatory system was carried out in MathCAD software by means of solving the derived differential equations of the system’s motion using the numerical methods of Runge-Kutta. Obtained results. Structural and functional peculiarities of the improved vibratory finishing machine for lapping flat surfaces of cylindric and prismatic parts were considered. Design (calculation) diagram of its mechanical oscillatory system was substantiated and differential equations of motion of oscillating masses were derived. Simulation modelling of the laps’ motion during their dressing was carried out and the correspondence of the obtained results to the input modelling parameters (operation in near-resonance mode with the given oscillation amplitudes) was analyzed. Scientific novelty. For the first time we obtained following results: spatial design (calculation) diagram of mechanical oscillatory system of the improved vibratory finishing machine was proposed; mathematical model of plane-parallel motion of oscillating masses (with circular trajectories of oscillations) was developed; possibilities of performing the laps dressing using “lap over lap” method were substantiated by means of ensuring their circular oscillations. Practical value. The results of the performed investigations can be used during designing new and improving existing structures of vibratory finishing machines for finishing treatment (lapping) of flat surfaces of cylindric and prismatic parts. 1. P. S. Bernik, and L. V. Jaroshenko, Vibracionnye tehnologicheskie mashiny s prostranstvennymi kolebanijami rabochih organov [Vibratory technological machines with spatial oscillations of working bodies]. Vinnytsia, Ukraine: VGSHN Publ., 1998, 116 p. [in Russian]. 2. O. S. Lanets, Vysokoefektyvni mizhrezonansni vibratsiini mashyny z elektromahnitnym pryvodom. Teoretychni osnovy ta praktyka stvorennia [High-performance inter-resonant vibratory machines with electromagnetic drive. Theoretical fundamentals and practice of development]. Lviv, Ukraine: Lviv Polytechnic Publishing House, 2008, 324 p. [in Ukrainian]. 3. O. S. Lanets, “Teoriia synfaznykh kolyvan u vibratsiinykh mashynakh z elektromahnitnym pryvodom” [“The theory of in-phase oscillations in vibratory machines with electromagnetic drive”], Vibratsii v tekhnitsi ta tekhnolohiiakh [Vibrations in engineering and technologies], no. 2 (40), pp. 46–59, 2005. [in Ukrainian]. 4. O. V. Havrylchenko, O. S. Lanets, and Ia. V. Shpak, “Teoriia vibratsiinykh mashyn z elektromahnitnym pryvodom ta synfaznym rukhom kolyvalnykh mas z vrakhuvanniam zhorstkosti vibroizoliatoriv” [“The theory of vibratory machines with electromagnetic drive and in-phase motion of oscillating masses taking into account the stiffness of vibration isolators”], Mashynoznavstvo [Machines Science], no. 9, pp. 19–26, 2005. [in Ukrainian]. 5. O. S. Lanets, Ia. V. Shpak, and Iu. P. Sholovii, “Mizhrezonansni vibratsiini prytyralni mashyny z elektromahnitnym pryvodom, rozrobleni na osnovi efektu “Nulovoi zhorstkosti”” [“Inter-Rezonant Vibratory Lapping Machines with Electromagnetic Drive Designed on the Basis of the Effect of "Zero-Stiffness"”], Avtomatyzatsiia vyrobnychykh protsesiv u mashynobuduvanni ta pryladobuduvanni [Industrial Process Automation in Engineering and Instrumentation], vol. 41, pp. 41–48, 2007. [in Ukrainian]. 6. O. S. Lanets, O. V. Havrylchenko, Ia. V. Shpak, and V. M. Zakharov, “Vibratsiina vykinchuvalna mashyna z elektromahnitnym pryvodom” [“Vibratory finishing machine with electromagnetic drive”], UA Patent № 938991, February 27, 2014. [in Ukrainian]. 7. F. Hashimoto and D. B. DeBra, “Modelling and Optimization of Vibratory Finishing Process”, CIRP Ann., vol. 45, no. 1, pp. 303–306, Jan. 1996. 8. F. Hashimoto and S. P. Johnson, “Modeling of vibratory finishing machines”, CIRP Ann., vol. 64, no. 1, pp. 345–348, Jan. 2015. 9. R. I. Silin, V. V. Tret’ko, and A. I. Gordeev, “Dinamicheskaja model' i ee realizacija v rezonansnom vibracionnom stanke dlja dovodki ploskih izdelij” [“Dynamic model and its implementation in resonant vibration machine for flat articles grinding”], Vektor nauki Tol'jattinskogo gosudarstvennogo universiteta [Vektor Nauki of Togliatti State University], vol. 3–1 (33–1), pp. 123–128, 2015. [in Russian]. 10. 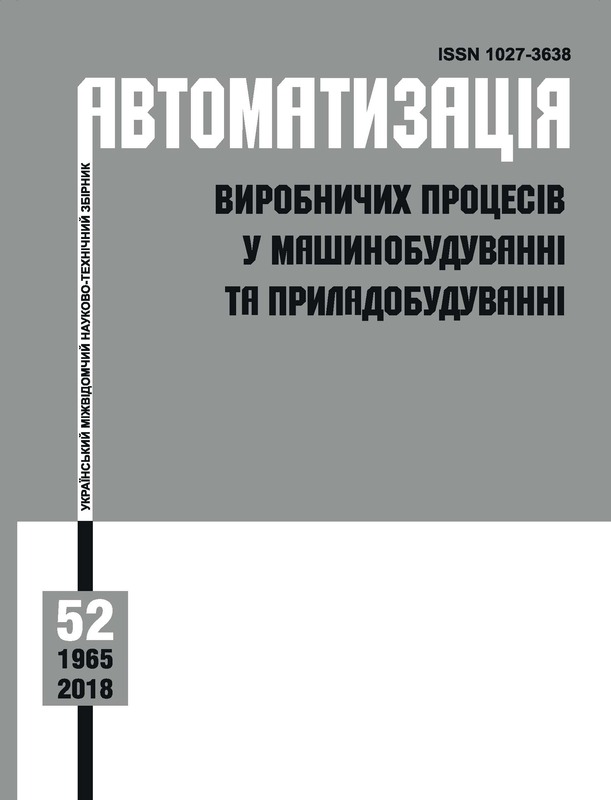 V. F. Makarov and K. R. Muratov, “Analiz oborudovanija dlja finishnoj abrazivnoj obrabotki ploskih precizionnyh poverhnostej izdelij” [“Equipment analysis for finishing abrasive processing of flat precision surfaces of products”], Vestnik Permskogo nacional'nogo issledovatel'skogo politehnicheskogo universiteta. Mashinostroenie, materialovedenie [Bulletin PNRPU. Mechanical engineering, materials science], vol. 19, no. 1, pp. 170–187, 2017. [in Russian]. 11. Y. B. Tian, Z. W. Zhong, and S .J. Tan, “Kinematic analysis and experimental investigation on vibratory finishing”, Int. J. Adv. Manuf. Technol., vol. 86, no. 9–12, pp. 3113–3121, October 2016. 12. A. Fries, “Apparatus for double-sided, grinding machining of flat workpieces,” US Patent 9004981, 2015. 13. I. V. Kuzio, O. V. Lanets, and V. M. Gurskyi, “Obhruntuvannia tekhnolohichnoi efektyvnosti dvochastotnykh rezonansnykh vibratsiinykh mashyn z impulsnym elektromahnitnym zburenniam” [“Substantiation of technological efficiency of two-frequency resonant vibration machines with pulse electromagnetic disturbance”], Naukovyi Visnyk Natsionalnoho Hirnychoho Universytetu [Scientific Bulletin of National Mining University], vol. 3, p. 71–77, 2013. [in Ukrainian]. 14. O. V. Havrylchenko, V. M. Korendiy, and V. M. Zakharov, “Formuvannia matematychnykh modelei tryi chotyrymasovykh kolyvnykh system vibrovykinchuvalnykh verstativ” [“Formation mathematical model three and four mass oscillatory systems of vibrating finishing machines”], Visnyk Natsionalnoho universytetu "Lvivska politekhnika" [Bulletin of Lviv Polytechnic National University], no. 866, p. 3–12, 2017. [in Ukrainian]. 15. V. Korendiy, and V. Zakharov, “Substantiation of Parameters and Analysis of Operational Characteristics of Oscillating Systems of Vibratory Finishing Machines”, Ukrainian Journal of Mechanical Engineering and Materials Science, vol. 3, no. 2, pp. 67-78, 2017.